Surrounded by green grasses and towering ancient trees, Zhaojun Tomb (zhāo jūn mù 昭君墓) is situated nine kilometers south of Hohhot. Standing on the top of the tomb, you can obtain a fabulous view of the vast plains and rolling Yinshan Mountains (yīn shān 阴山) undulating into the distance. It is listed as one of top eight popular scenic spots in Hohhot. Zhaojun Tomb, made of rammed earth, is 33 meters high, occupying an area of 1.3 hectare. Zhaojun Tomb is also called "Green Tomb" (qīng zhǒng 青冢) or Demure Wuerhu in Mongolian, which means Iron Fortress. It's said that each year when the weather gets colder, other grass becomes yellow and withered, while only the grass on this tomb remains green hence the name of Green Tomb. The Tomb is similar to the imperial tombs of the Han Dynasty (hàn cháo 汉朝) that were built in the central plain of the kingdom. There are pavilions around the tomb in which visitors can rest. Cultural relics commemorating Zhaojun are on display in an exhibition room nearby. 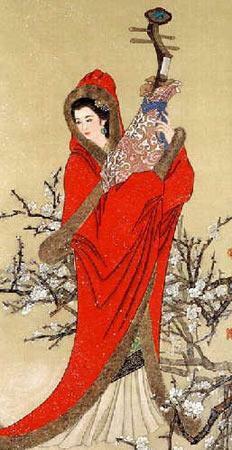 Wang Zhaojun (Wáng zhāo jūn 王昭君), also named Qiang (qiáng 嫱), was one of the four well-known beauties in China's ancient Western Han Dynasty. She was born in Xingshan County, Hubei Province (hú běi shěng xīng shān xiàn 湖北省兴山县) and selected to imperial palace because of her beauty. 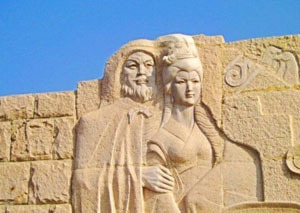 In 33 BC, Huhanye Chanyu (hū hán yé chán yú 呼韩邪单于), the emperor of Xiongnu (xiōng nú 匈奴), an nomadic ethnic group in the north, came to the Han imperial court and ask to be allowed to become an imperial son-in-law to express his willingness to enter friendly relations with Han. Zhaojun then married herself off to the grasslands of her own free will. In Xiongnu, she was granted as Ninghuyanshi (nìng hú yān shì 宁胡阏氏), the queen in Mongolian. During her life in Xiongnu, she lived in yurt, wore blankets and furs, ate animal meat and drank milk, showing her respect for local customs. Besides, she also made great contributions to remain the good relations between the Han and the Xiongnu group, and won the respect of local people. Meanwhile, she also brought the culture of Central China to the Xiongnu people and promotes the exchanges between two cultures. In order to commemorate her, the local people built the tomb after her death. The Tomb of Wang Zhaojun itself is also shrouded in mystery, in that no one knows whether the true concubine Wang lies beneath. Located about 9 km south of the city center, the tomb is one of 9 of its kind scattered about Inner Mongolia. The pyramid-shaped mound is 98 feet-high and is crowned by a pavilion on its summit. From the pavilion the views are nice: of the grasslands, farms and the small park that surrounds the foot of the tomb. The park contains a couple of interesting features, a statue of the couple together on horseback, and a rose garden that within contains a museum that holds a couple of steles, and clothing (inc. shoes), jewels & books that allegedly belong to the deceased. The tomb is famous for its spectacular scenery. The summer months are mild, and the wild flowers and grasses grow in abundance, creating a beautiful natural picture together with the towering green trees. When autumn comes in September, unlike grasses which shriveled and yellow at this time of the year, the grass growing on the tomb is still green and vigorous. In front of the tomb stand bronze statues of Wang Zhaojun and her husband (Khan), leader of the Mongolia ethnic group in Han Dynasty riding on galloping horses. 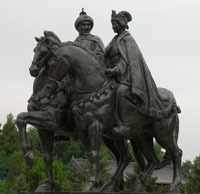 The statues are the symbol of the friendly relations between the Han nationality and the Hun nationality. 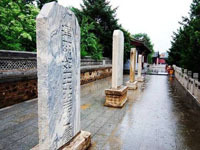 Behind the statues, there are several steles praising the achievements of Wang Zhaojun. Behind the steles, stone stairs and a stone platform are connected to the Zhaojun Tomb. Among them, the stele marked with the poems of Dong Biwu (dǒng bì wǔ 董必武) (a modern revolutionary and a politician) is the most notable one. Upon the stone platform visitors can obtain a pleasant view of the vast plains and rolling Yinshan Mountains undulating into the distance. Recently, the tomb area has been developed to include cultural facilities such as a Reception Room, Exhibition Room and Painting and Calligraphy Room. The tomb has now become one of the key cultural relics under the jurisdiction of Hohhot. You can visit herdsmen in the suburb and stay overnight at their house or in a yurt. The herdsmen are hospitable, kind and simple, and usually treat the visitors very well. Opening Hours: 8:00 a.m. – 6:00 p.m. Location: Nine kilometers south of Hohhot. How to Get there: You can get there either by taking the regular bus or by taxi from Hohhot.